Please pardon the huge chunk of Trader Joe's Seville Orange Marmalade missing out of the jar in the picture over there. I was hoping that the festive orangey glow of my sub-chair rail kitchen glow that the previous house owners so nicely left for us would help disguise the fact that this wasn't a full container, but no luck. Actually, no, I am pretty lucky. Got a wife and two kids who love every Thursday to come visit me at work for lunch. Granted, the littlest ones just might be more excited for the cookies from the work cafe, or walking thru our indoor arboretum, but I'll take it. Along with the usual lunch they'll bring him - hot cup of coffee, some veggies and fruit, and PB&J. My older one, M (not quite four years old) loves making them almost as much as she loves eating them, so it's what she does. It's what we do. Even (and perhaps especially) on weeks where we haven't had the chance to hit up TJ's, like this week...hence the partially used jar of orange marmalade. 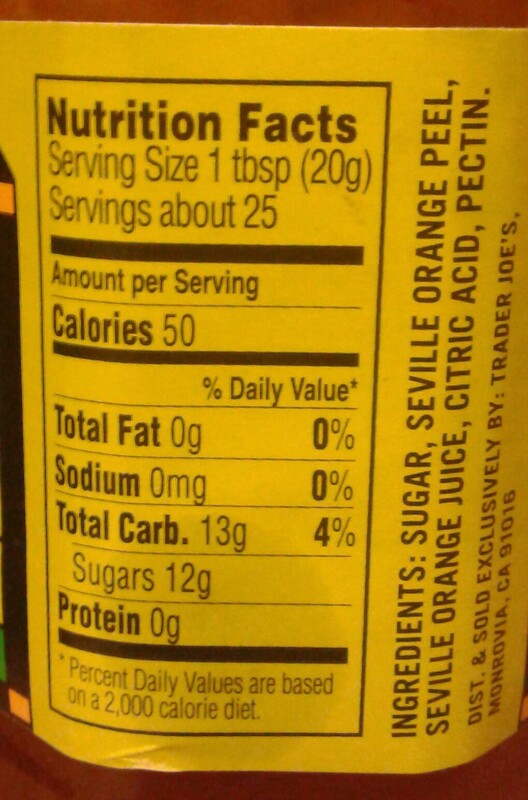 The kids don't like the TJ's marmalade. I don't blame them - it's a surprisingly sophisticated taste. Most orange marmalades I have tried focus on the super citrusy or super sugary or the thin line between the two...not this one. It's a deeper, stronger flavor than that. And, in comparative terms, it's bitter as well - not as in actually bitter (sugar is the first ingredient, after all), but it's fairly mature and won't leave you scurrying for a toothbrush afterwards. 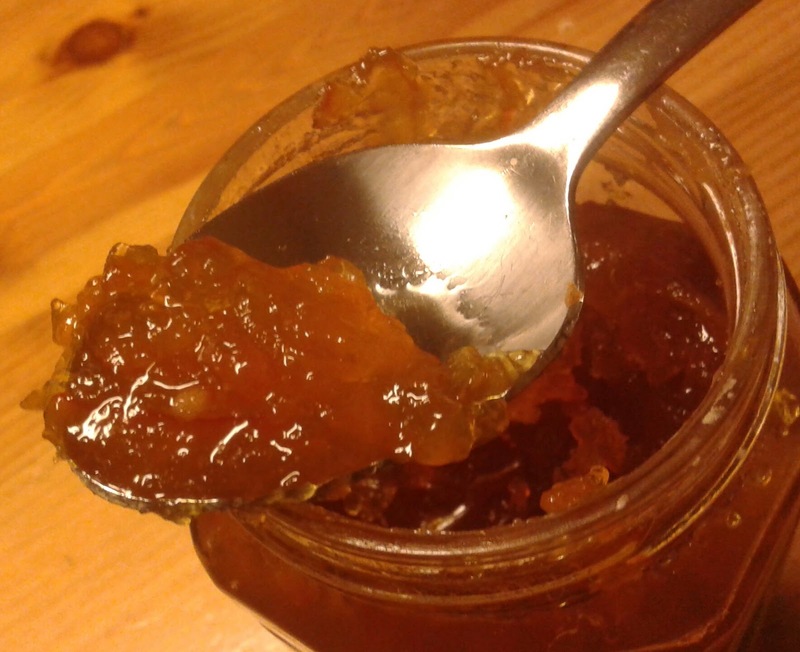 There's that certain marmalade texture as well - stiffer than regular jelly, more preserves like, with a fair amount of orange peel shredded up and stuck in there. How did that ever become a thing? It's not like grapevines get chopped up and stuck in grape jelly...well, not on piurpose, I hope, at least. Somehow thru the magic of delectable fruit, incorporating what ought to be the disposable wrapper into the actual product works fairly well for marmalade in general, and for this TJ's one in particular. Sandy and I have been to Seville on a day trip during our Portuguese honeymoon...well, that makes us sound like fancy folk. We're not. We may have seen plenty of Seville orange trees, but never partook of their fruit, so I cannot ascertain the taste accuracy...so we'll both settle for just enjoying the marmalade. Tasty on toast, scrumptious on scones, perfect for PB&Js - worth the pick up for sure. 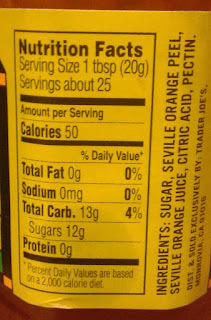 Seville oranges are also called bitter oranges. Sounds yummy. I am thinking of making some orange marmalade and chocolate chunk muffins with this. 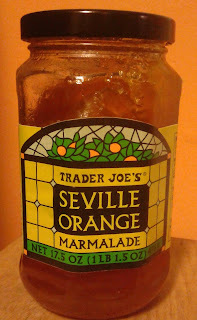 I love love love this marmalade. It is what marmalade is supposed to taste like. It adds a deep orange flavor to baked goods and sauces. My favorite it to pair it with the Trader Joes Ableskivers! "......indoor arboretum ...." ?!?? That sounds like one fancy office you work in! This reminds me of a marmalade, or "dulce de naranja" my Dominican grandmother use to make with "sour" oranges (they don't look so much like your typical florida oranges, they do have some green on them with a really thick skin and they are typically used to make a sour/spicy dominican sauce as well). So many good memories, I love it! Try crushing some garlic and adding some to this marmalade and finish some chicken on the grill with it a few minutes before you pull it off.